You could see this coming from 1,000 miles away: President Trump looking for any way to give Saudi crown prince Mohammed bin Salman a pass on the murder and dismemberment of journalist Jamal Khashoggi in Istanbul on Oct. 2. For six days after Khashoggi’s disappearance, Trump said nothing, not a word. On Day Seven he started in with the equivocating verbiage he always goes to when something looks bad but it’s in his interest to avert his gaze. Then came reports yesterday that the Saudis were working to come up with a “fall guy” theory that would attempt to distance bin Salman from the dirty deed. And today, in a phone conversation with Trump, that’s exactly what bin Salman did. He again strongly denied any involvement in Khashoggi’s disappearance and suggested people outside of his control were responsible. Trump, who is dead set on selling hundreds of millions of dollars in weapons to the Saudis, engorged the cover story. “It sounded to me like maybe these could have been rogue killers — who knows?” Trump said. Trump wants to believe despots like bin Salman and others because he would like to be one. — That bin Salman had every reason to be pissed off at Khashoggi, who had dared to write persistently and critically about the Crown Prince before leaving his homeland and relocating to the Washington D.C. area last year. — That American intelligence agencies had previously intercepted communications of Saudi officials discussing a plan to lure Khashoggi back to Saudi Arabia and then detain him. — That two planes carrying 15 Saudi agents, including a forensics expert, flew to Istanbul on Oct. 2, went directly to the consulate and later that day flew back to Saudi Arabia. — That the Turks had the consulate bugged and reportedly have audio, and maybe even video, of Khashoggi being beaten and killed in the consulate. But the Crown Prince, who at 33 is inexperienced at high-level skullduggery outside his country’s boundaries, badly underestimated how most world leaders would react. Instead of shrugs, what he got was international outrage. As for Trump, what he got today from several New York Times’ readers regarding his “rogue killers” theory was sardonic dismissal. 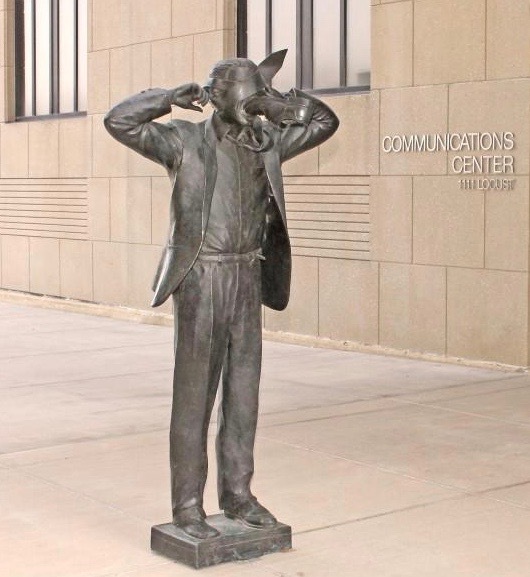 Reading The Times’ story, I soon thought about the distinctive hear-no-evil/see-no-evil-themed sculpture that stands outside the Kansas City Police Department’s communications building. The bronze sculpture, which has been at 12th and Locust about 25 years, depicts a businessman standing on a briefcase, with a big shoe in his mouth, his fingers tightly planted in his ears and a tie flapping across his eyes. I’ve always loved the whimsy of that statue and admired city officials’ courage in displaying it so prominently. Little did Terry Allen know back then that well into the 21st Century we’d have a president, symbolically at least, has his fingers firmly planted in his ears and his long red tie flapping across his eyes. Just follow the $$truth and morality be damned. And how many billion dollars did Obama send to the Iranians in cash on pallets? Trump brought how many Americans home from these petty dictators as opposed to how many Obama brought home? The biggest problem with creating outrage isn’t that it doesn’t deserve it, but that most in the press went along with Obama’s atrocities, including spying on journalists, for 8 years and said virtually nothing. As a result, half of America shrugs. There is only one cure and that is ruthless objectivity, all else is activism. I think those pallets of money went to Iraq for Blackwater and Halliburton. On Jan. 16, 2016, the same day four American detainees, including The Washington Post’s Jason Rezaian, were released, a jumbo jet carrying $400 million in euros, Swiss francs and other currencies landed in Tehran. That money purportedly was partial payment of an outstanding claim by Iran for U.S. military equipment that was never delivered. Soon after, $1.3 billion in cash followed. The cash transaction was controversial even within the administration. The Wall Street Journal reported that the head of the Justice Department’s national-security division objected that it would look like a ransom payment. State Department officials insisted the negotiations over the claims and detainees were not connected but came together at the same time, with the cash payment used as “leverage” to ensure the release of detainees. …That money did not go to Blackwater or Halliburton. Just Blackwater, Bruce; Cheney directed Halliburton’s share deposited directly into his account. That was Iran’s money, John. Makes no difference how it was returned. Terry Allen is also a great Texas Troubadour Country Western singer! I just listened to one of his songs on youtube…He’s got quite the twang. Spot on summary. “Bone saw” said it all for me.